Thomas Nastas, a member of Marchmont's Advisory Board, is presenting his series of blog postings on start-ups and start-up communities in Russia and beyond. 1.) What is the ‘spark’ that ignites the startup of start-up communities? 2.) How does the ‘start-up’ of startup communities differ—emerging markets vs. developed countries? 3.) Why is the US entrepreneurial model of experimentation, trial and error and pivoting a death sentence for entrepreneurs in the emerging markets? And what you can do about it. 5.) What is Clonentrepreneurship, where is it spreading from and to, and why is it a model for more—innovation, startups, and venture investment? I conceived this series for StartUp Communities, the blog of venture investor Brad Feld (Foundry Group, Boulder, Colorado, co-founder of Tech Stars, blogger Feld Thoughts). You might be unfamiliar with this phase ‘start-up community.’ So here’s a short intro to what it is and why it’s important to every country on Planet Earth. A start-up community is a place where entrepreneurs with ideas come together to start new companies, and can actually find the money and the talent to get their start-ups financed, staffed and launched. Most start-up communities offer appealing lifestyles, are cool places to live, to work, to have fun and do more—faster. Over time as more and more start-ups are created and financed, an entrepreneurial ecosystem takes root with success begetting success leading to a thriving start-up community. In the world of venture capital (VC), entrepreneurship and start-up creation, Silicon Valley is the quintessential start-up community in the United States, with the MIT/Boston area as #2. The term start-up community can be attached to a country as Dan Senor and Saul Singer did in their 2009 book Start-Up Nation: how Israel became a start-up ecosystem with sixty-three publicly Israeli companies traded on the NASDAQ stock exchange in the United States, more than any other foreign country. Start-up communities attract and breed entrepreneurs. Entrepreneurship drives economic growth and development, new jobs and of course, wealth creation. It’s this prosperity that cities, states, regions and countries around Planet Earth are trying to create, attempting to replicate—duplicate, to get things going; for their survival and renewal, by inspiring wannabe entrepreneurs to take the leap into the unknown and supporting resident entrepreneurs. I craft two other phrases in this series, Clonentrepreneurs and Clonentrepreneurship; words put together from Clone-Entrepreneurs and Clone-Entrepreneurship (but without the hyphen). Startup Genome recently published research on the most active start-up ecosystems around the world. It listed Moscow as #10. It’s great to see Russia’s largest city rocket into this spot, given that in 2001 less than $100 million/year was invested in Russian seed and early stage tech vs. billions of dollars of private equity money invested in fast moving consumer goods, real estate, construction, wholesaling, retailing, natural resources and other sectors that lifted a post-Soviet economy into the 21st century. Ten years ago only a handful of emerging growth tech companies existed in Russia including Yandex, Ozon, Mail.ru, Abbyy and Kaspersky to name five. The first three served primarily the Russian speaking market, the last two—international customers around the world. In the latter half of the decade, innovation became a priority of the Russian Government to diversify the economy from oil/gas with its investments in the Russian Venture Company (fund-of-funds with ? $1 billion under management) and the Russian Corporation of Nanotechnology (Rusnano, ? $10 billion under management, making fund, project and international investments in nanotech). Even with these efforts, the needle of tech investment crept up ever so slowly to $200 million ± 10% for seed and early stage investments in all sectors. But everything changed in 2010; investment in seed, start-ups and early stage companies more than doubled from 2009 and in 2011, doubled 2010 results. In 1Q 2012 the top Internet 10 investments raised over $80 million. Some pundits claim that investment will exceed $1 billion by end of 2012. What caused this acceleration in investment in just two years, and what are the take-ways for your start-up community; to increase the # of start-ups in your country and entrepreneurs making the commitment to new projects, the amount and velocity of venture money invested with the ‘Scaling Up’ of entrepreneurship, risk-taking and innovation for more? Certainly as the Russian economy rebounded from the lows of the global financial crisis, consumers and businesses were in the mood to spend. Russians increasing lived and breathed on-line with entrepreneurs serving up Internet models to capture their eyeballs and wallets. 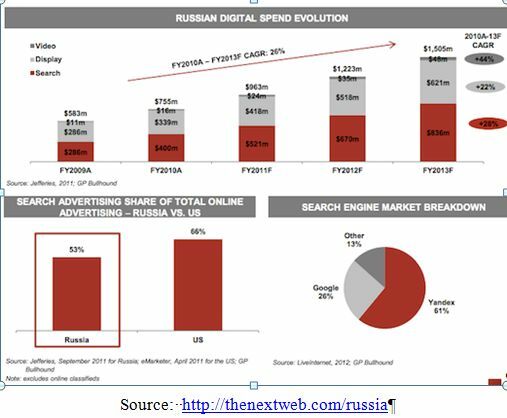 Online video advertising in 2011 doubled to $37 million from $15 million, Russian contextual advertising jumped to $430 million in the first half of 2011, an increase of 60% from 2010, Russian Internet advertising clocked in at $1.4 billion, up 56% from 2010 with display (banner) advertising’s 2011 spend up 45% to $510 million from 2010. GP Bullhound an investment bank based in the UK estimates that only 18% of the 53 million Russian internet users shop online, with online advertising consuming only 9% of Russian ad budgets. 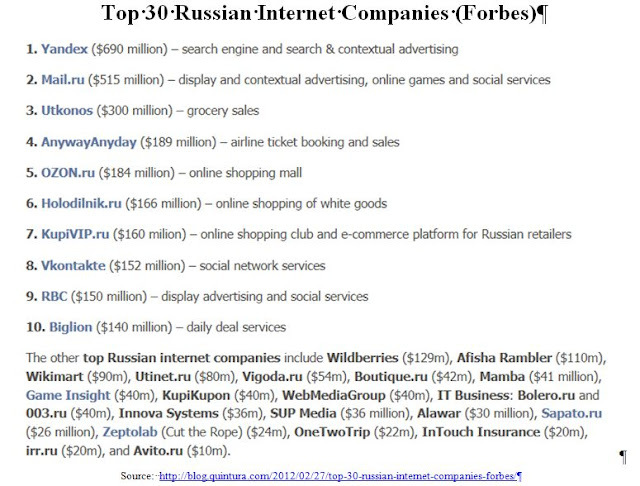 All of this growth translated into increasing revenues for Internet and Web companies with Forbes.ru listing the top 30 Russian Internet companies by their 2011 sales. Such growth attracts investors as honey lures bees. But it’s the nature of the deal flow that better explains the huge jumps in VC investment in less than two years and the wave of new entrepreneurs doing start-ups. 2010 was a ‘tipping point’ for the start-up of Russia through two liquidity events and underlying forces in the country. First was the acquisition of the Russian Groupon clone called Darberry by Groupon. From their formation in February 2010 to its purchase by Groupon in August 2010, Darberry showed the investment path for entrepreneurs and investors in Russia, business models with a real shot at attracting capital. While a handful of clones existed in Russia, Darberry’s sale was a major inflection point for more Russian entrepreneurship. The second event was the minting of a few billionaires and dozens of new millionaires from the IPO of Mail.ru (valuation—$5.71 billion, November 2010). After this new wealth splurged on cars, clothes, homes and travel, it financed new start-ups. Since these liquidity events, dozens of new start-ups raised hundreds of millions of dollars in 2010, 2011 & 1Q2012 with capital invested by new Russian funds formed to finance mainly e-commerce, social and gaming startup clones with US and European venture capitalists co-investing since they had experience with these business models in the West. 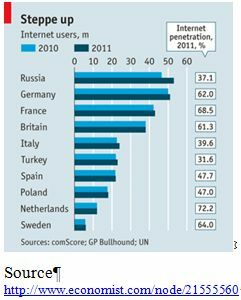 Prior to 2008 the Russian tech scene had no role models, no ‘mojo’ and little connection to the world other than oil/gas. It was widely known that Russia had deep human talent in mathematics and the physical sciences, yet few knew the route to exploit these assets for commercial ventures. Some took the path of outsourcing (India model) or system integration to build enterprises like Luxoft, IBS and TerraLink to name three. A few others walked a different road like Acronis and Parallels: creation of gamechanging technology for global customers (Israeli model) with R&D conducted in Russia and headquarters located in the United States. Neither of these endeavors generated the velocity of new start-ups being formed nor an explosion of venture capital investment. Yet if these were not the paths forward for the creation of a start-up community, then what was—since there was no clarity to what business models would capture the wallets of Russian customers and the cash of Russian investors? Certainly the creation of several dozen angel investors with tech experience was an impetus to the start-up of Russia as the market lacked ‘smart’ money. But that money has to find a home, and that’s where clones showed the way forward. Darberry demonstrated that cloning established Western Internet business models and localizing them for the domestic market captures growth. While profits eluded Darberry, it scaled quickly with revenues multiplying exponentially day-by-day. This was the signal that Russian investors needed to open their pocketbooks and finance the start-up of Russia. From Sept. 2010-2011, 20+ new start-ups and development stage companies raised over $400 million. New capital continues to flow into clones. KupiVIP (clone of USA shopping club Gilt Groupe, itself a clone of French deep discounter Vente-Privée) grew from launch (October 2008) to $200+ million revenue by 2011 with $65 million of new capital raised in 1Q 2012. In May 2012, Avito.ru, the Russian clone of Craigslist raised a whopping $75 million. Ok, so, uhm—what’s so revolutionary about entrepreneurs cloning the ideas of others and investors financing the start-up of clones? You're welcome to send comments, opinions and questions directly to Tom at mailto:Tom@IVIpe.com . We also encourage you to visit his personal website.